Birthdays are the important of milestone in life, they come only once a year like the most celebrated occasions for everyone. Stay together with your beloved family is one of the best ways to celebrate this event. 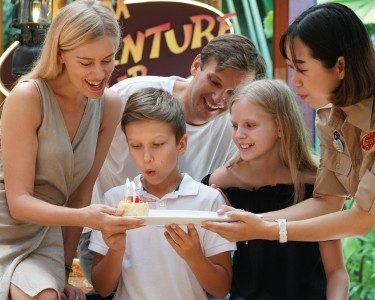 Novotel Phuket Surin Beach Resort make your simple birthday becomes memorable. We offers a specialty Birthday cake rewards to our guest with complimentary. Guest can enjoy a scrumptious birthday cake delivery by request in advance. We will bring you to the entrance of happiness by sending a letter to the you and invite you to join Siam Adventure Club desk and give the cake with mascots.